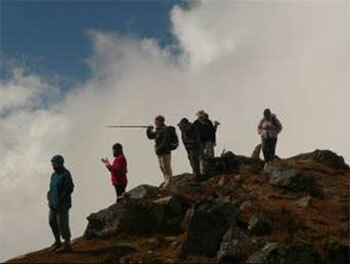 Last Trek Report - LANGTANG OCTOBER 2009 - Trekking in Nepal with Teresa, Slow Trekking for peoples of all ages. Judy and Neil, Penny, Robyn, Frank, Tony and Denise all arrived looking pretty fresh after a stopover in Bangkok. After a bite of lunch and a spell of flight recovery time we set off on a sultry afternoon to walk around the Kora circuit of Swayambunath, culminating in a climb up to the temple complex at the top. It was a special day for Hindu and Buddhists alike as it was full moon. However we only caught a glimpse through the clouds. We took a candlelit dinner on the terrace above the gomba. This group were already friends who regularly bushwalk together and I had met some of them in Canberra so there was an easy familiarity. Today was pretty full-on. After the traditional walk down to Thamel for real coffee and Danish pastries there was banking, gear shopping, permit acquisition, etc. I had to get back out to the airport to meet Thayne, Melissa and Jaynelle from Bacchus Marsh. (We thought it rather original to call them the “Marshans” but of course they had heard it a hundred times before). The Canberries managed just fine without me as Dorje and Mangal took them all over town. Well, apart from a very confusing loss of a pair of sunglasses. Robyn retraced her steps but couldn’t find them until she spotted Neil’s new specs. They were hers! An embarrassed shop owner gave Neil a very good price on another pair. I brought the Marshans down to town for their last-minute shopping and banking and we all enjoyed a top dinner at the Weizen. It was to be our last meat meal for three weeks so the troops made the most of it. The Canberries turned up a couple of reasonable bottles of red – very resourceful. After a taxi home there was a great deal of frantic packing, trying to fit newly acquired gear into the packs. I was still running around at midnight – but at least the weather had cooled down by then. Our big bus was ready for us at 7.30 and our porters were all there to help us bring the bags down. Anyone who has stayed at the BPD knows that this is no easy task. Dorje was definitely in charge, with Lahar as Number 2. Kancha, Akal, Lagpa, Manoj, Subash, Dorje’s brother Dan Raj and our new man Balaram (Ram) were the Khumbu boys. Lahar brought Kaji and Purna with him from Pokhara. The scenery en route was breathtaking (quite literally at times) as the bus wound its way over the hills and far away. We stopped for a cuppa in an obscure little village. Despite the loo being modelled on the original “black hole of Calcutta” the tea was fresh and the bananas were small and sweet. A quick daal bhat (only choice) for lunch in a tiny place in Trisuli was our next stop. Shortly after that the clouds enveloped us and there was no scenery at all. Just an eerie feeling of a huge void somewhere below the bus. We rescued some Dutch folk from a break-down in cold, drizzly conditions. I didn’t think they seemed terribly grateful. Dusk fell just before Syabrubensi as a fast flowing waterfall across the road, between two huge boulders, was skilfully negotiated by our brilliant driver. Guru ji indeed! He got an excellent tip after a quick whip round. Despite being told on the phone that the village was chock-a-block, we easily found a lovely lodge, the very one I had stayed at three years before. Good food and a few drinks helped us all unwind after a day of sitting still. It poured with rain that night. Hour after hour of torrential, monsoonal rain. I was frankly ‘concerned’. The first day of our trek was seriously hot, humid jungle-bashing at first but a light drizzle cooled us down. Then the drizzle turned to rain after lunch. With lots of plastic sheeting, good ponchos and the proper gear we set off into the forest for the climb up to Lama Hotel. Someone (??) had previously described this day as ‘a doddle’ so although we were a bit tired we had no doubt we would make it up the last ‘couple of hours’. Three and a half hours later a very exhausted rear guard stumbled into Lama Hotel. I’ve written in my diary that we tumbled into bed tired but in good spirits at having ‘made it’. Load of rubbish. The Marshans wondered what the hell they had let themselves in for and I was seriously doubting my own ability to remember this trek at all. We opted for a leisurely start today – 9.30. No rush as Gora Tabela was (from memory) just 4 hours away. But it rained A LOT, and it was nearly 3.30 when the last of us got into the lodge. It was Thayne’s birthday and the kids at the lodge made him a birthday card with a cake painted on it – we had no chance of the real thing. Singing and dancing after dinner from our porters made a party atmosphere. Too well-fed we turned in early, still unused to the long days on the trail. 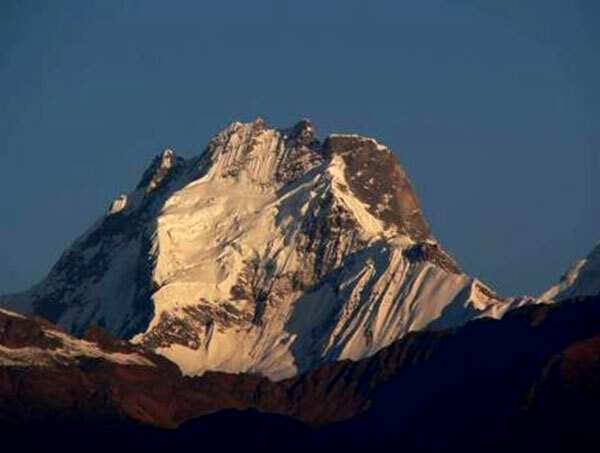 There were stars in the sky and the tip of Langtang Lirung had been glimpsed so we went to bed in optimistic spirits. Our faith was rewarded when the day broke fine and clear. Stunning in fact. Not a cloud in the sky and Langtang Lirung dazzling white in the morning sun. We all leapt out of bed in our pyjamas to gape at the wondrous sight. Very cold. Our porters soon showed up with a tray of hot chocolate – good on you guys. We nursed our warm cups as we gazed in awe at what we had really come to see – great big white snowy peaks. The walking on this day was great. Not much altitude gain and not that far either. Dazzling views all day with waterfalls going full-bore after all that rain. 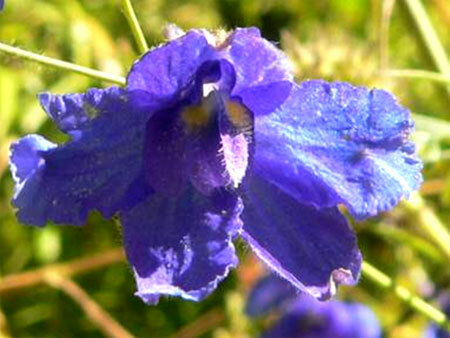 I was blown away by the flowers, a bit unexpected in late autumn. Wild delphiniums were my favourites. A deep cobalt blue against a background of foliage just beginning to turn to autumn colours. Loved it! Stayed at the Eco Home and it was just as good as remembered. I wrote these notes in the sun after a hot shower, on a full stomach of garlic and potato soup with fresh chapattis and Lemon tea. Yum! After a good night in with a few games of piggy (thanks Nikki) we slept in our big, wide, soft beds – some more soundly than others. The altitude is starting to kick in now and it can make you a bit restless at night. Some of us are on the Diamox (I find it helpful). Boiling water at night for our drinking water made a nice hottie. The weather on our fifth day out broke cloudless and crisply cold. Breakfast was taken outside in the sun. It was so nice there that the Marshans opted to stay till after lunch as it’s only a few hours up the trail to Kyanjin Gomba. The rest of us got away at 9.30 but then took an hour to meander through the village. It’s a big village with lots of local wooden houses, lots of work being done outside and very, very friendly locals. These are Tamang people (similar to our guide Dorje) but these Tamangs are a bit more influenced by Tibetan culture and language. The women at work were particularly photogenic. Ascending the old glacial moraine afforded fab views back down the valley. The ancient mani wall is the longest one I’ve ever seen. This walk to Kyanjin Gomba is meant to take 3 hours. Denise and I made it by 3.30 from a 9.30 start. We treated a kid with an injured hand; we gazed at the scenery and examined lots of flowers and plants along the way. 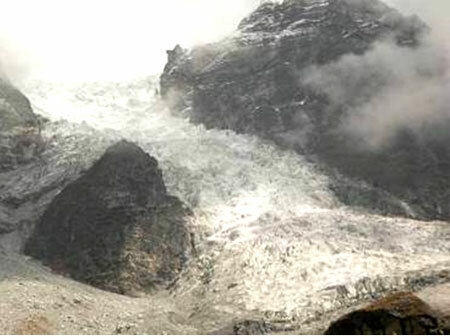 The hanging glacier just before the village was amazing, something I completely missed on my last trek up here. 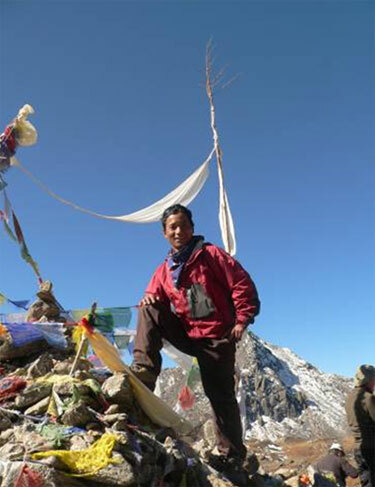 It’s quite hard trekking over 3500 metres, even on this reasonably easy trail, and we were well-pleased to see Kyanjin Gomba hove into view over the last ridge. It is really just a trekking village but the lodges are sturdy and built of stone then beautifully wood-lined. All the local yaks and horses seemed to drift across our front garden at dusk. The Marshans got in at 4.30, which surprised the hell out of everyone. 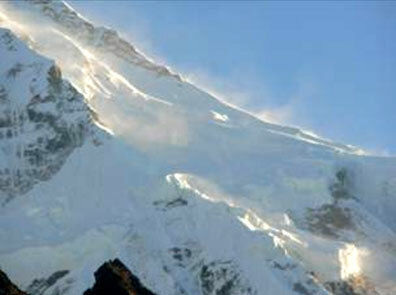 They had clearly shopped their way from Langtang to KG but it hadn’t slowed them down. They were clearly hungry though as they made a play for Tony’s dinner (spare momo ??). Kyanjin Gompa turned on the most spectacular sunrise but not everyone felt like more trekking today. There were six starters for the day-walk out to Langshisha Kharka. They set off fairly early with chapattis, boiled eggs and a thermos of hot tea and four porters. I wrote this at half past two and they’d yet to return. However our new German friends, Hannah and Ute had spotted them on the homeward trail not long since. It was apparently pretty cold coming back. Myself, Thayne, Melissa, Jaynelle and Frank (who likes a sleep in) spent a lazy day. We shopped for hand-made woolly hats and scarves and bought a kilo of yak (technically, nak) cheese up at the local dairy. The dairy was pretty basic but the cheese was good, especially with chapattis and lime chutney. The front yard is a swathe of green lawn, cropped to within bowling-green neatness by a procession of yaks, horses, donkeys and goats which have been wandering past all day. Women in traditional clothes are going about their chores, long, plaited hair swinging down their backs. We decided to stay for another day to climb up for a better view of the glaciers. It was an easy decision as the lodge is excellent and everyone was handling the altitude well. Of course we are all a bit sluggish in the rarified air but no serious problems. The day-trippers piled in around 3 pm declaring the walk and the picnic ‘bloody marvellous’ and ‘pretty easy’ – will definitely do that again next season. Today, our third at Kyanjin Gomba looked a bit gloomy to start with and we briefly toyed with the idea of starting back down. Then the sun came out during the discussion and we kept to our original plan of a short day-walk to the glaciers and then a free afternoon to wander around the village and catch up with ourselves a bit. The glaciers, three of them, looked good up close. The walk up was a bit strenuous but we all seem to have found our ‘trekking legs’ – it had been one week on trek exactly. We reckon we got to about 4300 metres in altitude and the walk was extremely pretty. Three hours up and one hour down. Most of us had a hot solar shower this afternoon and are ready for the big descent tomorrow. I got a nice clear line to Germany today (at 150 rupees per minute) which cheered me up enormously. We were a bit slow starting this morning after a great session of singing and dancing in the dining room last night. Couldn’t get the Latvians to dance though. The weather didn’t look that promising at first, it’s the way of the mountains sometimes, but the clouds soon dispersed and we set off for the long walk down in clear sunshine. After a really blissful 3-hour trek, meeting some great locals along the way, we arrived back at our old lodge Eco Home to find a daal bhat banquet set up on a long table in the sun. It was a feast and nobody felt like moving on afterwards. Well, maybe Robyn did. Robyn liked to get out in front for a bit of peace and quiet to better find the birds she is so fond of. Khaji is developing good spotting skills and they really make a great team. 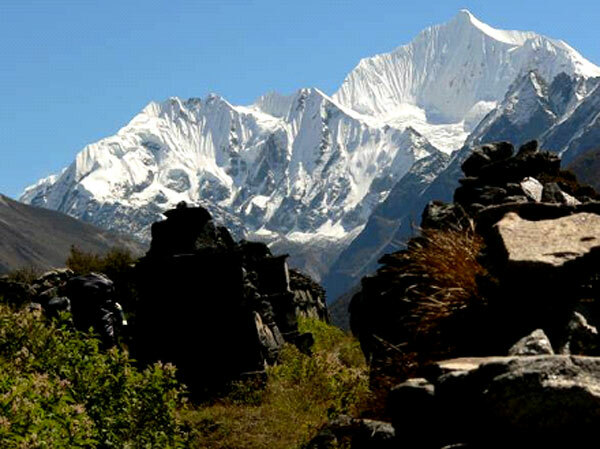 Tony might have been sorry to leave Langtang too as a beautiful young Tamang girl had offered to marry him next year when she is the right age. I think Denise may have fancied herself in the role of ‘senior wife’ there for a moment. It was getting a bit cooler as we hit Gora Tabela so a very quick cuppa saw us heading into the woods once more for the downhill trek to Riverside. This was a really basic lodge but they fitted us all in, if rather snugly. The ‘three madams’ as Dorje put it, were in a bigger room with sacks of rice and other stores. Dinner was cozy in the small dining room with the fire going. I had a small problem during the night when I got up for a pee only to find a large, very stubborn mule asleep on my doorstep. He only woke up when I eventually tried to step over him – which was a bit disconcerting at the time. This day was a long, long descent through the woods. The trail was much drier than on the way up. We stopped at Lama Hotel to collect all our ‘unessential’ gear we had left there on the way up. Robyn managed to phone home on a very dodgy line, but it was clear enough to hear some very good news. She had a new grandson, 3 days old now, named Taj. Of course we had a party to celebrate that night. The girls in their lodge (we were spread over two lodges) sang their hearts out and it sounded fabulous combined with our porters. Both lodges were pretty basic though so we will try to stay at Bamboo next season. Great party though. We left Landslide (rather happily) at around 8 am and the Marshans were first into Thulo Syabru before noon!!! They seemed to have got the hang of trekking. Tony, Denise and I finally slumped into our seats at the lunch table around 2 pm. It was quite a hard climb and it looked as though the younger members were really hitting their straps, despite serious worries about Melissa’s blistered feet over the previous couple of days. The route was a stiff climb but very scenic, with a long walk along a hot, sunny ridge followed by a steep descent to a large metal bridge, quite a high one. The climb up to TS seemed endless but it was always interesting as we passed farms and houses more and more often. The Lama Hotel at Thulo Syabru is a bit of a concrete bunker. However, lots of hot water in attached bathrooms was greatly appreciated. Our washing was all done by a very enterprising laundry service (thanks Kancha) and I could scarcely recognize some of our crew at dinner in clean clothes with washed hair. We rose early to see the sunrise on the Ganesh Himal range behind Thulo Syabru then most of us went back to bed for as long as we liked (nice for Frank). Luxury! The village of TS was bigger than most we had visited with several little shops, internet and telephone services. The lower part of the town especially has its own unique style of houses and lots of rural activities in and around them. As I wrote this Robyn had gone off to look for birds, Penny and Judy tagged along to sketch and paint. Tony and Neil are discussing matters of a philosophical nature in the shade of the verandah. The boys are playing cards on the roof. 360 degrees around the village are stunning views. Nowhere else I would rather be. 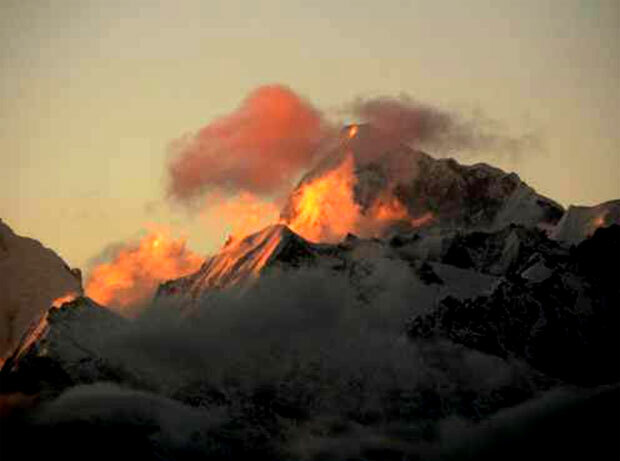 Nepal is wonderful! We tried for an early start from TS to climb the steepest section in the cool of the morning. We weren’t totally successful. It was a long, sweaty climb up to the first tea stop but the views were stupendous at every ‘breather’. We lingered over our morning tea in glorious sunshine. Further up the trail we soon entered a magnificent stretch of forest. The trail was steeply up but now we were trekking in the deep shade of massive oaks and hemlocks. The forest gave way after about an hour but it was still steeply up. I shared a Mars with Denise and that helped a bit. The lunch stop at Dursagang is the most stunning location imaginable. Perched on a sun-drenched ridge which falls away a couple of thousand metres on both sides, the views of the Ganesh Himal all the way into Tibet were amazing. Langtang Lirung and Langtang II were peeping over the clouds too and the hills surrounding the peaks were laid out in rows before us. Magic! Thayne, Melissa, Jaynelle and I stayed back with Lahar and Purna to soak up more of the view and the sun. It was hard to leave. When we did the trail immediately sank into deep, cool, shady pine forest with a much gentler slope than before. Then the pines gave way to thick rhododendron forest with their slightly grotesque smooth pink twisting trunks and limbs. Some varieties had a papery, peeling skin. A mist enveloped us for a while giving the walk an eerie quality. Despite our intensive scanning of the woods the only Red Panda we saw was our lodge. This is surely the best lodge in the Langtang region. Stone buildings, pine lined, with western toilets in white-tiled bathrooms. Everyone loved the ‘really really hot showers’. The Marshans had been considering returning via Dunche as the trek got increasingly difficult but after their performance over the past few days there was no doubt that they could do the pass. They are to decide in the morning. Awoke to a cloudy morning at Sin Gomba. Breakfast was a treat as there were several ‘bakery items’ on offer. I had the French toast, made with a white bread roll soaked in seasoned egg – super. Melissa was a bit under the weather so, along with Thayne, Jaynelle and I she asked for a late start. No worries. The boys played karenbot in the weak sunshine while the rest of us had another coffee round the rekindled stove in the dining room. 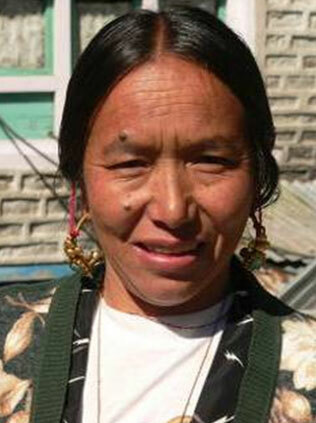 Our hostess, Pema, runs a very good lodge. Though a bit steep at first, the morning walk above SG is beautiful. It gradually turned into a much gentler slope through ancient pine forest. 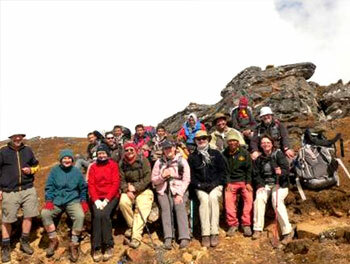 Shortly after crossing to the northern side of the ridge we reached Chalang Pati for lunch. We had caught up with the rest of our group who were just about to move off having stuffed themselves with apple strudel and cinnamon rolls. 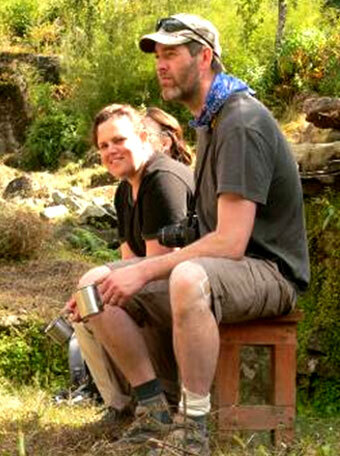 Our group moved inside as it clouded over and had our lunch on a table built around the stove – Langtang-style. Our boys ate a huge daal bhat. We don’t call them the Bhat Mara (rice killers) for nothing. 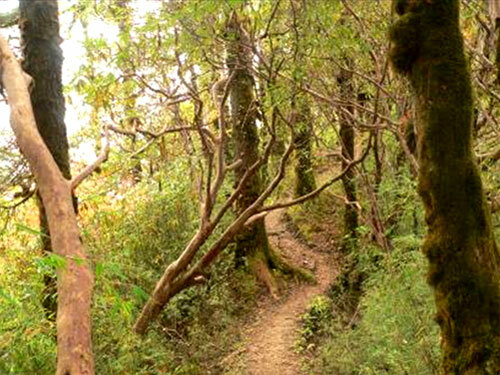 The trail above Chalang Pati was fairly steep but graded steps were helpful. It was eerily silent. The trees and bushes became smaller and smaller till we reached Laurebina Yak at 2.45. Local estimates from a rather derisive lodge owner had been 2 – 3 hours. We had done it in 1 hour 45 minutes. It was certainly a pleasant change from the last time I had done it in slippery snow and ice. Despite a cloudy afternoon the sunset at Laurebina Yak turned on a typical 5.30 light show as we all dashed upstairs for our cameras. Dinner was excellent, mostly veggie-burgers with chips. The boys were all still singing and dancing when we went to bed. It was the night of the Diwali festival (festival of lights) and the lodge kids lit fireworks outside. It was only partly clear on the morning of the 19th as we headed up, up, up towards Gosainkund. It was a pretty hard grind at first and then progressively more harrowing and more beautiful every few minutes. The first lake sparkled in the sun as we edged along our cliff-side trail. We were pretty whacked as we tumbled into the Lake View lodge in a heavy mist, alternating with very light sago snow. We were almost delirious with a combination of altitude, happiness at having made it to Gosainkund and a kind of rapture at what we were seeing all around us. The afternoon held fine enough for Neil, Judy, Robyn, Penny, Tony and Denise to circle the holy lake and perhaps earn some merit for the next life – or perhaps just some good karma for the rest of the trek. It certainly worked on the second score. Melissa and Thayne when to the lookout on the lake (very romantic) and the boys (bless ’em) climbed a 300 m trail to raise some prayer flags atop the nearby ridge. We thought the lodge a ‘bit basic’ but of course we hadn’t seen Gopte at that stage. We slept in thermals and hats and were actually quite cozy. There may have been some apprehension about what ‘the pass’ would be like. As in, how hard it would be. Having seen the clear trail from the lodge, no snow, no ice at all, I knew that, as long as the weather was good, we would all manage well. We had our bed-tea before sunrise and ate our porridge in the dark. Poking our heads out at daybreak, with all our warmest clothes on, we saw exactly what we had hoped for. The day was a stunner. Not a cloud in the sky, just a few stars still visible in the pre-dawn light. So we set off on the most beautiful day imaginable as one lake after another came into view while we gained altitude. 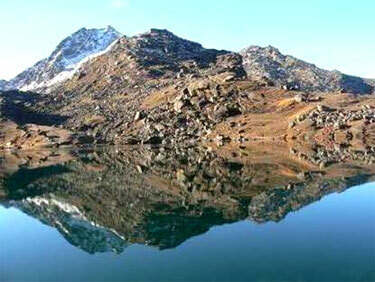 The tranquil lakes reflected the surrounding peaks in perfect symmetry. It was only 300 metres up to the pass but all the altitude is gained in the first hour or so. It was pretty tough going but the views sustained our efforts. Every time we glanced back we could see more and more and more of the mountains; an infinity of white peaks behind russet ridges mirrored in crystal water. We made the pass in just 2 hours and threw off our packs to wander around the flags and take pictures of each other. The descent seemed endless (possibly more so for the poor buggers coming up). Our lungs appreciated the richer air as we quickly dropped a thousand metres. It felt good not to fight gravity for a while. The High Camp provided a welcome tea-stop and we broke out the chapattis and cheese we had brought with us. Lunch, just an hour later at Phedi was a rather disappointing affair. The lodge here is particularly dilapidated (new one nearly finished though). We thought we could do better at Gopte. We were wrong! And it was so-o-o-o-o-o far. The rearguard got in just on sunset – utterly exhausted. Even the crummy rooms with no space around the beds, plastic at the windows and the odd plank missing from the floor could not dampen our spirits. A very large bottle of rum was consumed around the stove and then a long, hard sleep was had by all. (Well, perhaps not Thayne and Melissa). The stars were brilliant (we saw them every time we had to go to the loo) and a distant red glow over Kathmandu told us we were now ‘somewhere else’. This morning broke fine and sunny again. We didn’t get away till after nine, there being not enough space in the rooms for more than one person at a time, unless sleeping. The trail was a lot tougher than I remembered with many steep ridges to cross. But it was incredibly lovely as the sun slanted through huge thickets of rhododendron, pine and bamboo. We made Therapati for a lateish lunch but were certainly not capable of continuing on, especially as we knew it was a steep descent up ahead. A thick mist soon shrouded the village (collection of four lodges). I wrote this in a sleepy, post-lunch atmosphere in the dining room. The fire is finally going well (thanks to all who persevered with it) with the sun periodically piercing through the mist. Robyn is doing Sudoku. Penny, Judy and Denise are playing Scrabble. Tony is asleep on the padded bench, as is Jaynelle. Melissa and Thayne are snuggled up for warmth. A much-needed afternoon off. From Therapati the Himalayas are spread out in a wondrous array at dawn. It was cold up there but we took our coffee in the first rays of the sun outside. We didn’t hang about as we knew we had a fair way to go today. Thayne’s knee was continuing to give him grief (more than he let on I suspect), particularly on the downhill. And there wasn’t much else for the next few hours as we dropped hundreds of metres through a glorious forest. Misty and atmospheric at first, we soon warmed up as we navigated some pretty treacherous descents. When the trail did flatten out here and there we were able to enjoy the woods in silence, except for the birds. Rhododendrons twisted overhead, covered in various epiphytic plants – mosses, lichens, orchids, fungi, etc. By the time we reached the bottom our legs were killing us. 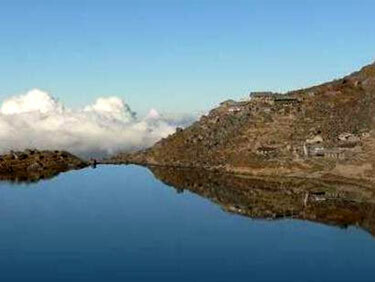 When the village of Melamchi Gaon came into view I thought about 10 – 15 minutes would do it. But it was another torturous half-hour down deeply eroded gullies that appeared almost perpendicular. Our lodge was a very pleasant surprise with large, airy rooms and thick foam mattresses on normal-sized beds. The hot bucket showers were a hit with everyone and the cooking was excellent. The evening seemed a bit slow (the result of drinking beer at lunch I suspect) and we were all in the doldrums a bit with what I call ‘down syndrome’. The traditional kitchen was beautiful. Unfortunately, our porters weren’t shown the same hospitality as we were. 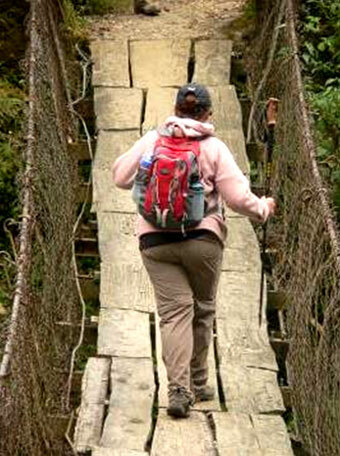 It’s a Sherpa thing we’ve encountered before in the Khumbu. 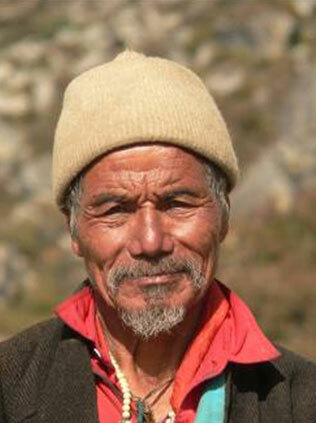 Our Tamang, Gurung, Rai and Magar porters are considered a lower caste by these people. Pity. Although the trail from Melamchi Gaon was steep it wasn’t half as bad as the day before – and of course we were getting used to it by then. Near the bottom of the hill someone jokingly asked Akal for ‘five cokes thanks mate’. We had no idea we were so near the lunch stop and in no time Akal was back with cold cokes. I’m not the world’s biggest coke fan but that drink went down a treat. I thought this lunch place our best ever. The Riverside lodge nestled in lush veggie gardens beside a giant boulder (the size of a small block of flats) near an ancient chorten. The sun shone, chooks strutted about and our boys helped make the lunch on the verandah of the half-renovated lodge. (Possibly a good stopping place for future treks). We were given cucumber with chilli/timbur dip to start and then soup and fried rice sprinkled very liberally with fresh coriander. Wow! The climb after lunch was outrageously pretty with fields of yellow mustard and pale pink buckwheat ripening in the autumn sun. It was hot though, damn hot. Just when I had begun to say, out loud, ‘enough already’, we were at the entrance to our lodge. Tarke Gyang was a bit of a special lodge with dinner served in the old kitchen/dining room all seated on the floor. The cook was on holiday so our porters cooked up a storm. Twice-cooked chips and then a full daal bhat with a few beers in a cozy room with a few new friends. Perfect. Our boys had to make the breakfast themselves today, with a bit of help from Judy and Penny. They had a hoot making chapattis on the wood-fired stove set into the floor of the dining room. We were all set to trek as Khaji had put us through a great set of exercises after bed-tea this morning. There seemed to be rather a lot of climbing today, considering we had to eventually descend. Up and down through dense jungles and over occasional patches of terraced farmland. Our lunch stop (thanks Tony) was idyllic, good to see a village after so much forest. Old chortens, covered in moss, dotted the trail. It was pretty tiring though and Thayne’s knee was not improving. Decided to make camp at Sermatang, having originally hoped to make it to Kakani. Our lodge was ‘rustic in the extreme’ and some of the rooms had damp and mouldy walls. A few rum and cokes on the tiny terrace, a splendid sunset and the promise of some Nepali singing and dancing after dinner lifted our spirits. We had a kind of ‘show and tell’ with the porters answering questions about their lives at home. Really enlightening. (Must do it earlier in the trek next time). Lots of dancing after dinner and Tony finally got a nice warm bunk in the kitchen. Arrangements were made to hijack the local truck which had been a bit startling to see as we emerged from the jungle. All happy. The Marshans, four of the porters and the entire luggage had a bumpy, scary but ultimately fun ride down to Malemchi Phul Bazzaar. Melissa didn’t have to say ‘Bistari m…. f….’ once. Phew! There was a jeepable road from Sermatang to Kakani which afforded beautiful views back to the mountains. We got a very early start and enjoyed the cool morning walk. The lodge (the one we might have had ??) at Kakani looked super as we had our proper breakfast. Might try for it next season. The trekking trail down to MPB was not easy. Steeply downhill, becoming hotter and dustier around each corner. MPB was a bit of a dump (civilisation can be ugly) but we found a nice garden lodge for lunch. The Marshans were already there and Thayne’s shave and haircut rendered him barely recognisable. Our bus was waiting for us at 2 pm and it was a bumpy old ride back to Kathmandu. With just a short stop at a grubby little roadside café for tea we still didn’t get in till around 7 due to heavy traffic on the outskirts of Kathmandu. Great to watch such splendid scenery going by with your feet up. Our nice clean rooms with made-up beds, clean sheets and hot showers seemed heaven-sent. Very early night after a few glasses of Jumpin Jack and Gossips – pretty damn good wine under the circumstances. Boy, were we tired! A long, slow start to the day today with a very leisurely breakfast and lots of laundry being handed in or hand-washed and put up on the rooftop to dry in the clear sunshine. Much less hot and smoggy than when we left. We all went into Thamel for a shop around with frequent stops at the Weizen to refuel. All shopped out by 5 pm as various taxi-loads were dispatched back to Kopan. We tried for a mountain flight to Everest this morning but fog descended on the valley and flights were seriously delayed. We bailed out of the crowded departure lounge around 8 and re-booked for 31/10. I took the Marshans around the older parts of Kathmandu, up to Swayambunath and a visit to Bina's little jewellery shop – it really is a gem. We dined at Fire and Ice on great pizza. Judy, Neil, Penny, Denise, Tony and Rukmini (I think) went out to Patan with Dorje. In the evening we had one of our very best meals. The Garden Kitchen at Boda has lovely food in a great garden. Just the thing after a few laps of the stupa in the fading light with all the Tibetans carrying you around in a swirl of humanity. Robyn has gone off to Chitwan with Khaji for a few days of animal-watching in the jungle. We later heard that they had a great time including riding elephants, bathing elephants, paddling rafts and bushwalking, looking for rhino, crocs and, of course, tiger. None of the latter but plenty of the former. A top time I believe. The Marshans left today but we said goodbye to them very early and headed off to Nagarkot for a posh breakfast with views. The views were spectacular (unlike the breakfast) and then the 4-hour walk down to Changu Narayan was a delight. Seeing village life so close up was interesting. It was harvest time and lots of people were making raxi (vile local alcohol). Baby goats everywhere and lots and lots of children. The temple at Changu Narayan is a marvel, the oldest in the valley. It’s a bit shabby and unrenovated but that’s what I like about it. Dorje made a good job of the tomato soup (the cook at our regular lunch place was away). The bus wasn’t due to depart for half an hour so we decided to set off towards Bhaktapur and jump on the bus as it passed us. We walked most of the way. It was blissful. Everyone waved hullo. When the bus finally picked us up it was very crowded and Dorje and Frank had to ride on the roof – I think they liked it. Bhaktapur is another marvel of Newari architecture dating back over many centuries. The pagoda originated here and spread throughout Asia. These early examples are a wonder to behold, perfectly proportioned, and almost close enough to touch from our intricately-carved bedroom windows. We dined on the rooftop terrace overlooking the most beautiful square, with ancient pagodas looming in the dark. Wonderful. We each did our own thing in Bhaktapur this morning. Some got up early and really wandered all over the town. Others had a nice lazy start with breakfast on the terrace around 9. I liked that. Penny and I bought beautiful old brass bowls, the sort the Nepalis use to make floating flower arrangements. Then our own minibus swiftly delivered us back to Kopan. We had a bit of free time this afternoon – time to pack up – and gathered at 4.30 for another look at Boda – and another meal at the Garden Kitchen. We walked over there which is always interesting. Visited the Bright Future Community Centre and Computer School today. The kids were just amazing and the crew enjoyed the interaction. Generous donations too – thanks folks. I headed into town later with Judy, Penny, Neil, Denise and Frank. We visited Bina’s little treasure of a store in Kimdol. Good silver, real stones, reasonable prices and a further discount for our customers. Ideal. Lots of presents were bought and Denise loaded up with goodies to sell to friends as a small fundraiser for the Bright Future Centre – Good on ya Denise! We taxied down to Chhetrapati and wound our way through the old market area of Assan Thole and Chandi Chowk buying spices for cooking at home. We found Tony at the Weizen and headed for Fire and Ice, the best pizza place in town. Robyn had flown in from Chitwan and was waiting for us with a platter of antipasto. The bottle shop nearby was raided and we soon had a party going. The pizza, as ever, was sensational, especially the Paesana, my personal favourite. Robyn filled us in on the Chitwan trip. Khaji had been treated as a respected guest whom Robyn had particularly liked. Pictures of rhino, river paddling, elephant washing, etc. were passed around. They had obviously had a great time. I forgot to ask about birds??? The minibus home was full of singing and clapping, even when we got slightly lost. No trouble sleeping tonight, even in our rather noisy neighbourhood. Why do Nepali dogs sleep all day? So that they can bark all night of course. We had another attempt at a mountain flight this morning. Same result – too cloudy. So again we bailed on the plan early and gave ourselves plenty of time to get home and pack for the flight back to Australia. Tony is off to India with Rukmini in a couple of days (I ran into him a couple of days later at the Weizen – where else?). It was a bit of a teary farewell at the airport. Denise, Neil, Judy, Robyn, Frank and Penny, I won’t forget you. Jaynelle, Thayne and Melissa too – hope to see you over Christmas. GREAT GROUP! NB: Hoping to run this in March with an option to bail out on the last five hard days and return via Dunche if the descent sounds a bit daunting. This is going to cost $2650 AUD for a month in Nepal all inclusive. Book your own flights. Get in touch on teresadidi@slowtrekking.com or vonschwichtenberg@gmail.com, teresadidi@slowtrekking.com if you are interested. Call me in Australia from December 14 to Feb 12 on (061) 03 9315 9617. Check out the website at www.slowtrekking.com for a detailed itinerary for next March 2010 (not yet amended to include the option to return from the pass).